Onychoschizia on the hands is much more than a nuisance. Namely fingernails speak not only about neatness and our living habits, but also about our general health. In this article we will give you some excellent natural recipes for strengthening the nails, which will completely eliminate the problems that we daily have to face with onychoschizia. Although the shape and strength of the nails are genetically determined, their quality is influenced by external factors, particular diseases or disorders in the diet. Shooting nails are caused by poor nutrition, weather conditions, and insufficient intake of fluids in the body, dishwashing and strong laundry detergents, low-quality nail polish and polish removers. Sometimes it is enough to just take a look at the individual person and to look at their hair or nails to conclude what their health is. Shooting nails, dryness and longitudinal grooves on the nails usually alert us to a lack of proteins and vitamins A, C and B as well as iron deficiency and zinc. Those nails are brittle and dry and their flexibility depends on the water content in them. Soft nails unlike them are very easy to cut and can bind up to 30 percent of water. Mentioned problems can be caused by physical injuries including the most common nail biting, but if you using acetone and other solvents for removing nail really often the same can happen. Now when we found out why the fingernails get damaged, we have to say something more about the treatment. For onychoschizia the market today offers a wide range of products. Be careful and do not forget that most of them are filled with chemicals (even those products on which the declarations states to contain a certain percentage of natural extracts). Under label vitamins for hair and nails today you can find really everything - from quality products to those which are not. A healthy diet is very important to strengthen the immunity. Diet based on daily intake of large quantities of vegetables and fruits and even up to 50 percent of the total amount of food ingested during the day is the best preventive. For good healthy nails eat mandatory almonds, hazelnuts, walnuts and other high-quality nuts, we recommend cashews, which are rich in iron and protein. Consume larger quantities of liquid, carrot juice, mint tea should not be avoided, eat oatmeal every morning to help prevent further onychoschizia on the hands. One hard-boiled egg yolk and 4 grams of beeswax melt on a steam, add a bit of peach oil and stir until it gets an excellent cream polish. Every evening rub the cream on the nails and put on cotton gloves. If onychoschizia on hands is your problem try the following recipe: Melt the beeswax on the steam when it cools down to body temperature, briefly dip your nails in and dry them. Put on cotton gloves and leave until morning. Mix 2.5 dl of oil and half a cup of vinegar. Soak nails in this mixture for a few minutes. The treatment lasts for ten days. Shooting nails are certainly not pleasant for any of us, and to help you to strengthen brittle nails we recommend 1-2 times a week to practice a bath of warm vegetable oil with the addition of 3 drops of iodine and 5 drops of lemon juice. In a smaller glass vial pour sunflower oil (about 6 dl), four drops of tincture of iodine, and five drops of vitamin A. Apply on nails twice a day. Warm the olive oil on steam and plunge the nails in for 10 minutes. Then rub olive oil into the nails and the flesh around them. The recipe for natural strengthening of nails: heat the milk to be warm not hot, and soak your hands and hold in for 5 minutes. Every night rub vegetable glycerine on the nail and let it stand overnight. Stir a tablespoon of olive oil and a tablespoon of castor oil with one teaspoon of honey and 1/2 a teaspoon ground walnuts. Gently apply the mixture on your nails and hands and rub. Finally rinse with lukewarm water and apply moisturizer, scrub nails. Do this once a week. Therapy for strengthening nails with the above natural recipes will yield results after 10 days. White streak on the nail points to a lack of vitamin C, protein and folic acid. If they break and we notice vertical and horizontal grooves on the nails it warns us of a lack of vitamin A and B. 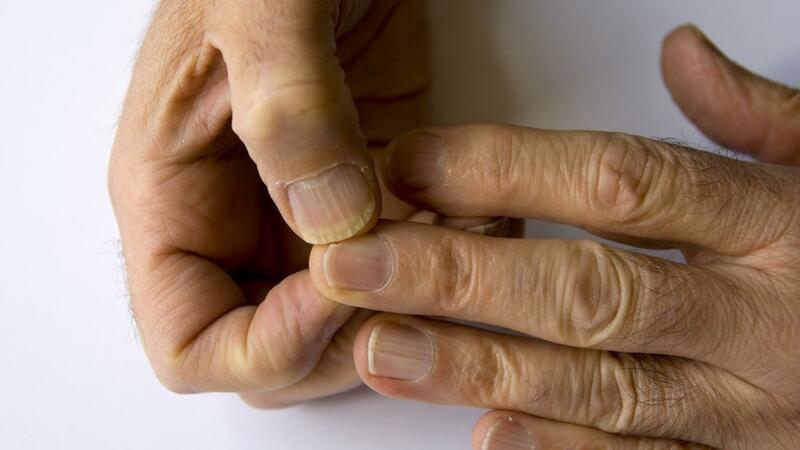 Dry and with hooked ends brittle nails tell us about lack of vitamin B12. Corrugated nails on the hands as well as the emergence of white spots symptoms suggest the lack of iron and zinc. Onychoschizia in children and adults is a sign of a lack of hydrochloric acid. Drink a glass of warm water with the juice of half a lemon daily. To cope with these problems, daily eat foods rich in exactly those vitamins and minerals. If the therapy and nail care, we suggested does not bring the expected results, be sure to do a detailed analysis of your blood test, to make sure that you do not have symptoms of anaemia which can also cause the above mentioned condition. We recommend you to read the text: Fingernails fungus on hands.